I’m writing to say THANK YOU for helping to make a dream come true… a new East Providence High School! 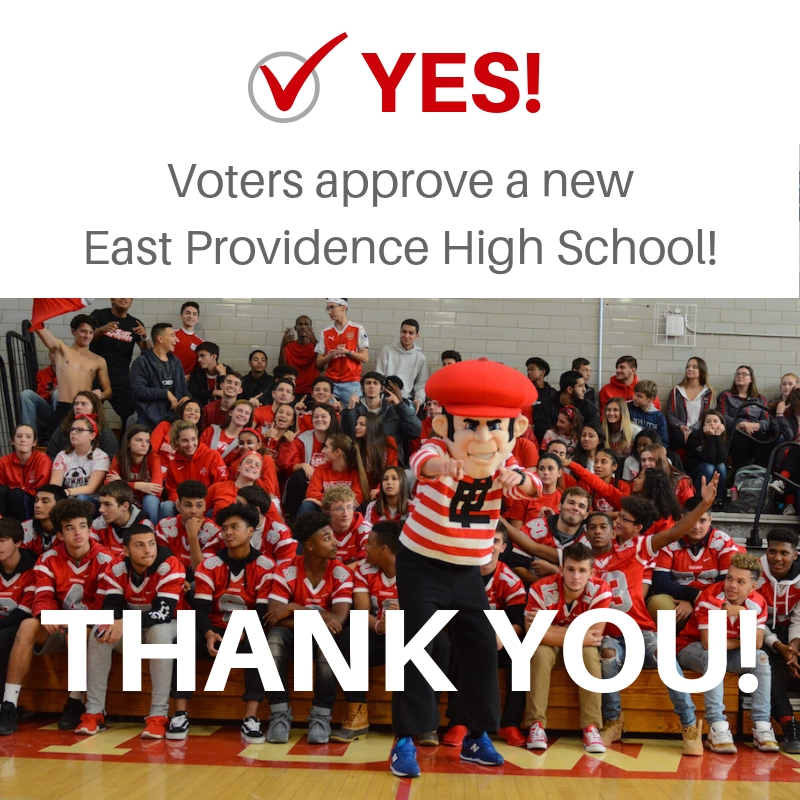 Yesterday, the voters of East Providence overwhelming approved Question 4 to finance construction of a new high school. The referendum passed with nearly 78% in favor. We are also thrilled that Rhode Island voters yesterday approved Question 1, a statewide ballot question to finance $250 million in bonds for local school facilities projects. As a result, the East Providence High School project will now receive as much as 74.4% State reimbursement on eligible costs, rather than 54.4% if Question 1 had not passed. I join the East Providence School Committee and Building Committee in thanking and congratulating everyone who worked so hard to ensure passage of the referendum. Our community came together with passion and determination to seize this incredible opportunity for our students and our city. The support for these ballot questions affirms the deep commitment to public education here in East Providence. Now it’s time to roll up our sleeves once again to get this exciting project underway, in order to open the doors of a brand new, state-of-the-art, comprehensive high school in 2021. Throughout the design and construction process, we will continue to keep the community involved on our website: www.EPbuildingcommittee.com. You can also follow the project on Facebook: www.facebook.com/BuildEPHS. Congratulations again, and thank you for tremendous support! P.S. For complete election results from East Providence, visit https://www.ri.gov/election/results/2018/general_election/east_providence/.